First Line: He took a drag on the cigarette as he watched the bookshop. Delaney Nichols has adapted well to her new home in Edinburgh, Scotland, even though it's so completely different from where she grew up in Kansas. She loves her job at The Cracked Spine, a bookshop that specializes in rare manuscripts and other valuable historical objects, and she's gathered several good friends around her. Her employer Edwin MacAlister is entrusting her with bigger and bigger jobs. 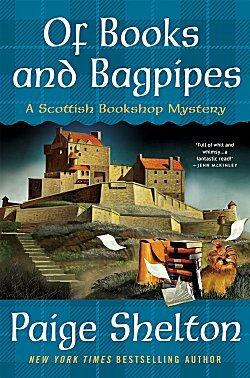 Her newest one is going to Castle Doune to obtain a hard-to-find edition of an old Scottish comic, although she does think that the transaction that Edwin has devised is more than a bit cloak and dagger. Unfortunately, Delaney finds a body on the castle ramparts, and from the William Wallace costume he's wearing, he's a perfect match for the man who was supposed to give her the comic. When Delaney runs to call the police, she finds the copy of the comic, its pages battered and fluttering in the breeze. Instinct tells her to take the pages, hide them under her jacket, and take them back to the bookshop. Doing so ensures that she must solve this very complicated mystery. Paige Shelton has crafted an excellent puzzle of a mystery filled with plenty of misdirection to keep readers guessing. Her main character has just the right amount of budding romance with the handsome Tom, and she furthers her Scottish education by traveling by train and visiting Sterling and the Wallace Monument. If you overlook her tendency to trip over dead bodies, you have to admit that Delaney is having the perfect adventure in Scotland. She's not faced with too much culture shock because she's surrounded by a buffer of friends consisting of her co-workers, Tom, and her landlords Elias and Aggie. She doesn't even have to brave public transportation all that much because Elias has a taxi and insists on driving her to many of the places she needs to go, just like an overprotective father. I do have to admit to one small grievance (other than Delaney keeping evidence from the police): Edwin MacAlister himself. All his secrets, all his being unable to be reached by telephone or any other means, not only makes him a rather puzzling sort of businessman, it makes him downright annoying. He needs to show more trust in his employees/chosen family. I'd also like to know more about the treasures in that warehouse of his, but it may be a bit premature to ask him for a guided tour, especially since I've just filed a complaint. I'm ready... Bring on Delaney's next adventure in Scotland! I'm drawn to the setting right away, Cathy! And I love the idea of The Cracked Spine! What a great business. It sounds like a very decent read. It certainly is that, Margot!